George Eliot (1819-1890) was the author of Middlemarch, Silas Marner, The Mill on the Floss, Daniel Deronda and three other novels. They were known for their realism and psychological insight. Rosemary Edghill (born 1956) writes mostly science fiction and fantasy, although she began by writing romance. She has written about 37 novels altogether. Both names are pen names and both authors took on pen names to hide their identities as well as for better known reasons. George Eliot took a male name to ensure her works were taken seriously. Novels by female authors at the time were generally considered to be frivolous. But she also wanted to prevent scandals over the fact that she lived with a married man (George Henry Lewes). Rosemary Edghill is also known as eluki bes shahar (lower case intentional) and her real name may be Eluki Besshahar, although there seems to be some confusion over which name is the pen name and which real. She may have been advised to choose a pen name that was more “American” but she probably also wanted to hide her personal details, as there are very few of those to be found. 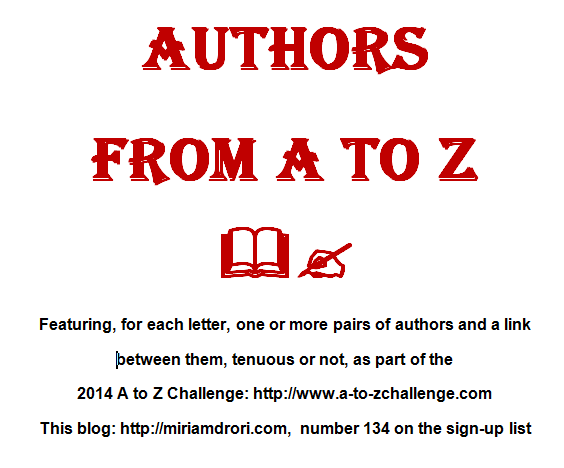 A to Z Challenge Participant/2011,12,13,14…..